Chris Eggleston was fast in Truck Series practice at Texas Motor Speedway on Friday. 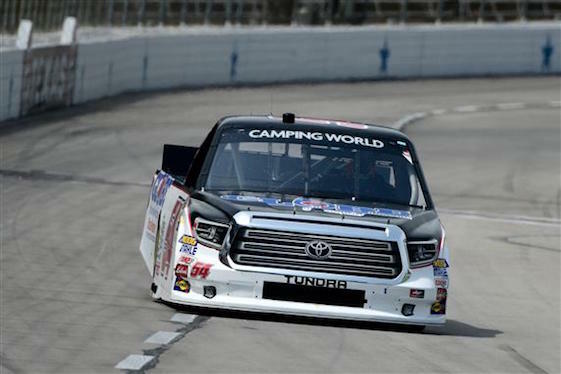 FORT WORTH, Texas – Final practice for the NASCAR Camping World Truck Series’ PPG 400 at Texas Motor Speedway was cancelled Thursday afternoon after rain drenched the Dallas-Fort Worth Metroplex. Personnel in attendance around the 1.5-mile oval were warned to take cover in permanent structures as a strong cell entered North Texas from Oklahoma. Only two practices were on the schedule this weekend for the NCWTS, which is sharing track time with the Verizon IndyCar Series for Saturday night’s race. The cancelled 50-minute NCWTS session will not be made up Friday. The 33-truck field is scheduled to qualify for the 167-lap/250.5-mile event at 5:45 p.m. (EDT). The race is set for 9 p.m. on FOX Sports 1, MRN and SiriusXM NASCAR Radio. Rookie Chris Eggleston topped an opening practice conducted in mid-90-degree weather under sunny skies with a lap of 29.853-seconds/180.886 mph in the No. 54 Toyota Tundra. Eggleston was followed by Noah Gragson at 29.909-seconds/180.548 mph in the No. 18 Toyota. Two other drivers cracked the 30-second barrier. Point-leader Johnny Sauter, the 2016 series champion, was third-fast at 29.926-seconds/180.445 mph in the No. 21 Chevrolet Silverado. Sauter was followed by Stewart Friesen at 29.948-seconds/180.313 mph in the No. 52 Chevy. Eleven of the 33 drivers entered never have been to “The Great American Speedway.” They are Eggleston, Todd Gilliland, Camden Murphy, Robby Lyons, Brett Moffitt, Bo LeMastus, Dalton Sargeant, Justin Fontaine, Spencer Davis, Kyle Donahue and Bayley Currey. Of that group, Moffitt is the only driver with a win under his belt this season. He also sits third in the point standings. The night will be especially significant for Gilliland. The 18-year-old, third-generation NASCAR driver will walk across the PPG 400 pre-race stage where Texas Motor Speedway President Eddie Gossage will conduct a commencement ceremony and present Gilliland his diploma for completing all of his required high school credits. Sauter and two-time NCWTS champion Matt Crafton are the only drivers to have visited Victory Lane here as the series resumes after a two-week break. Sauter has a 59-point lead over Gragson following the former’s most recent victory on the 1.5-mile Charlotte Motor Speedway oval. The win was the first for Sauter at CMS, and also marked his 10th victory with GMS Racing since 2016. Sauter has four wins this season and is working on a streak of 20 consecutive top-10 finishes at 1.5-mile tracks. Additionally, the last time the Truck Series visited Texas, Sauter took home the hardware. Starting fourth in the JAG Metals 350 Driving Hurricane Relief on Nov. 3, the Wisconsin native led 21 laps en route to edging Austin Cindric by 0.170-seconds. It was Sauter’s fourth career Truck Series victory in Fort Worth and his second consecutive in the November race. In 19 starts in Cowtown, Sauter has four wins, nine top-fives, 15 top-10s and three poles. The four victories are the most for Sauter at any racetrack. Sauter has won consecutive races three times during his career _ 2013, 2016 and 2017. Drivers from the Truck Series are scheduled to take part in an autograph session Friday afternoon at the Texas Motor Speedway display outside Turn 4. U.S. Concrete Qualifying Day for the PPG 400 will follow that session.